Recently I spoke at the amazing DIY Cultures with Black Feminists to talk about black women in DIY culture, with me focusing on black women in DIY punk. Even though we were all so scared we were physically shaking we ended up having a great time and in my research I found this great band, ESG (Emerald Sapphire Gold). 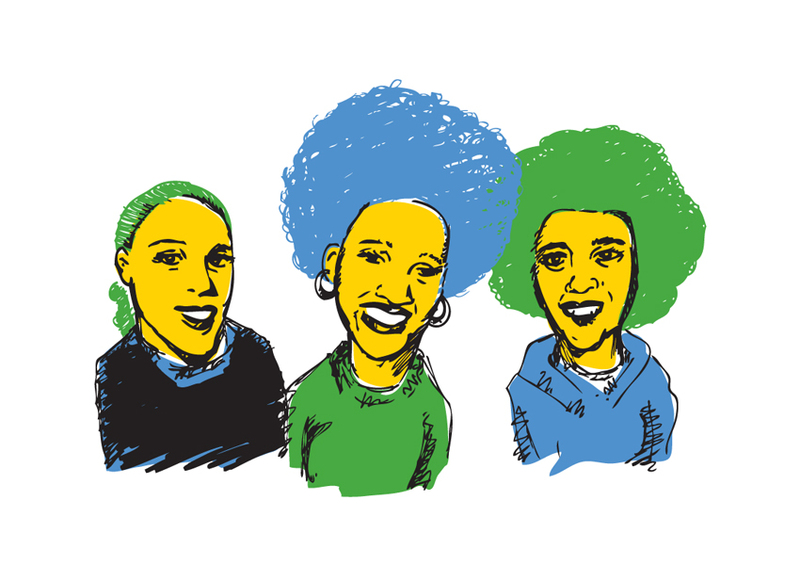 ESG are a dynamic band made up of the Scroggins sisters (Renee, Valerie, Marie and Deborah) from South Bronx, US, who emerged in the early 80s and were an influential presence on a range of musical genres including hip-hop, post punk, disco and dance. The band, who were encouraged by their mother to play music, originally began playing music together to keep themselves out of trouble with neighbourhood gang life. The group’s sound is centred around complex polyrhythms, with congas, drums and beefy basslines all battling together till the end of the song. Listening to their songs you can hear their hypnotic rhythms in Yeah Yeah Yeahs, their experimental nature in Throwing Muses and their throbbing funk influenced bass lines in Luscious Jackson. Their song ‘UFO’ is one of the most sampled in hip hop and has been used by Public Enemy, Big Daddy Kane and LL Cool J to name a few. The band even wrote a song about it called ‘Sample Credits Don’t Pay Our Bills’. The band also has a cult status in the punk / new wave scene and were courted by bands such as The Clash, Gang of Four and Public Image. I love their strange almost oddly empty afrobeat sound. I think it completely challenges the idea of what kind of art a black woman can make because from listening to this you couldn’t predict that anyone would come up with this. The sisters were true pioneers and have broke up and reformed several times over the years. It annoys me so much that I’ve only just found ESG. As a shy, black punk I needed them when I was a teenager and wondering why I hated the ska punk pop my friends listened too, I needed them at uni when I desperately wanted to start a band but couldn’t see how I would fit in, I needed them when I wanted an example for black female creativity. I guess I have them now and I should be grateful. Now I’ve heard ESG I’m going to search out all the black women in bands that are making or have made crazy, experimental music and try and make my own crazy, experimental music. Now you’ve heard ESG, what are you going to do with them? Tags: emerald sapphire gold, esg, hip hop, new wave, new york, post punk. Bookmark the permalink.